Bob Iverson is still on edge after a collector harassed him for months about $6,000 in debt he said belonged to someone else with his name. "You don't know. Is it going to end? Is it going to come four years down the road, three years down the road?" 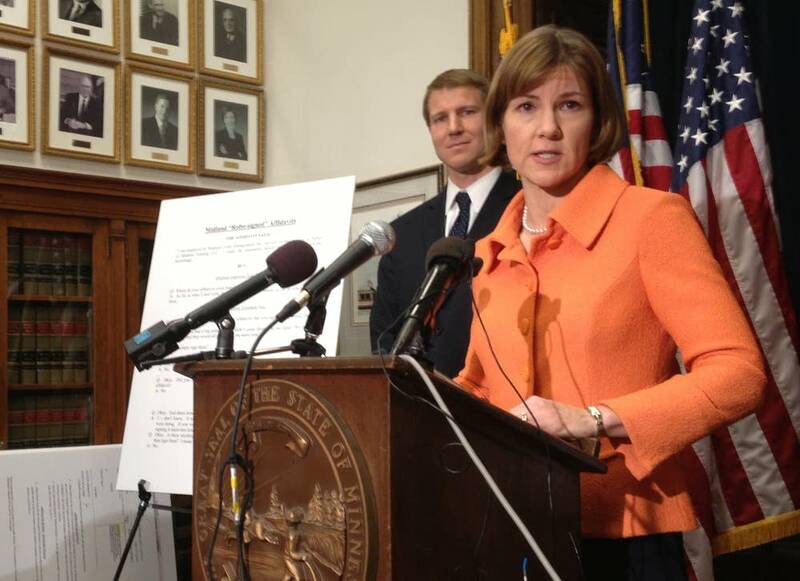 Iverson said during a news conference with Attorney General Lori Swanson. The company, Midland Funding LLC, has agreed to pay the state $500,000 to settle a lawsuit Swanson filed in 2011. It will also follow a series of restrictions designed to address problems Swanson raised in the lawsuit. And the company must also resolve outstanding and future consumer complaints like Iverson's. The company is not admitting any wrongdoing as part of the settlement. Swanson had accused Midland, part of Texas-based Encore Capital Group, of "robo-signing" affidavits in collections lawsuits and sometimes targeting the wrong people for payment of debt it had purchased from banks and credit card companies. Midland, one of the largest debt buyers in the country, has filed more than 15,000 lawsuits in Minnesota courts against individuals since 2008, according to Swanson's office. Debt buyers make a profit when they collect on debt they've purchased from financial institutions for cheap. Often, the lawsuits they file go unnoticed by the consumers, Swanson said. When the consumer fails to show up in court, the companies are able to get a judgment that can authorize them to collect the money, she said. The settlement requires Midland to prove that a debt is owed before taking steps to collect it, Swanson said. "The burden would really shift in a meaningful way to Midland to substantiate that they owe it," she said. An Encore Capital executive said in a written statement that much of what the company agreed to in the settlement had been in place since 2009 when the company improved its affidavit process. "After significant effort examining our company, Midland confirmed to the Minnesota Attorney General that no systemic issues were found with our current affidavit process. In addition, we confirmed that the underlying consumer debts are valid and that our current affidavit process accurately describes those debts," said Greg Call, Encore's senior vice president and general counsel. Midland officials said the company has agreed to stop all collection activity with Minnesota consumers who had contacted the Attorney General's office since 2005. The settlement was approved by Hennepin County District Judge Denise Reilly. Swanson said Midland is not the only debt buyer that has violated consumers' rights, and she said she plans to push legislation next year that would place tighter regulations on debt buyers, saying Minnesota's current laws are too lax. She said she also expects further enforcement action. "This is a real problem area. It's a relatively new industry that if we were here 30 years ago didn't even exist, and so we're going to keep on this," she said. "We have other consumers who have been targeted by other companies, and we want to see those practices come to an end." One consumer who participated in Swanson's news conference on Wednesday said she only discovered the company was after her for someone else's debt when she found $9,000 missing from her bank account. Ka Yang, of St. Paul, said she was able to get Midland to repay the money, but she's still out $2,000 after hiring a lawyer to help get her money back. "I'm really angry," she said. "I'm here because I don't want this to happen" to others.